Demonstrators rally against police brutality in memory of Eric Garner on Aug. 23, 2014, on Staten Island, N.Y. 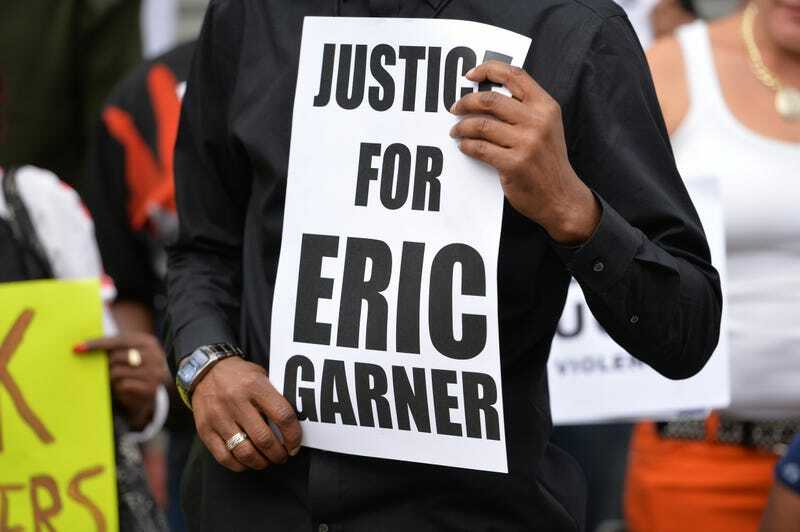 The Department of Justice has overhauled the Eric Garner investigative team, replacing the New York team of agents and lawyers looking into his 2014 death, the New York Times reports. The move, which the Times describes as a "highly unusual shake-up," could put some steam into the long-stalled case and possibly put the department back on track in seeking criminal charges. As the Times notes, the case has had its issues because federal prosecutors and the FBI in New York were against bringing charges. However, prosecutors with the Civil Rights Division at the Justice Department in Washington, D.C., argued that there was clear evidence in favor of doing so. FBI agents who have been investigating the case have since, in recent weeks, been replaced with agents from outside New York. Federal prosecutors in New York City's Brooklyn borough have also been dropped from the case, leaving it unclear as to whether civil rights prosecutors from D.C. would work alone in presenting evidence to a Brooklyn grand jury or in trying the case if charges are ultimately brought. Garner's controversial arrest and police-choke-hold death in 2014 sparked nationwide protests, marked by the rallying cry "I can't breathe," which were the Staten Island dad's last words.